Description: the bow fires at least twenty arrows per second and has the power of a horse kick behind each one of them. Effect: By shooting arrows made of green reshi towards the opponent, once an arrow pierces any amount of flesh, it sinks into the opponent, and makes the designated area rather numb, untikl three posts afterwards it burns as if it were on fire, until the reshi reaches there limbs, disableing them. 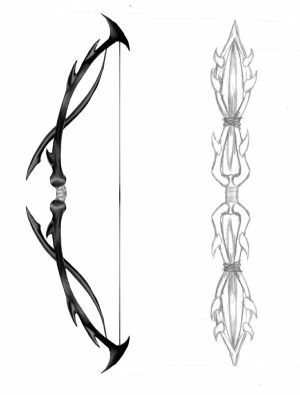 Effect: the arrow will pierce their flesh, and then begin driving its way towards there heart and lungs, however the arrow can be stopped if the user releases their weapon into its second/third state. Description: 1200 arrows per shot and very little power but enough so that it feels like wooden staves beeing driven through.